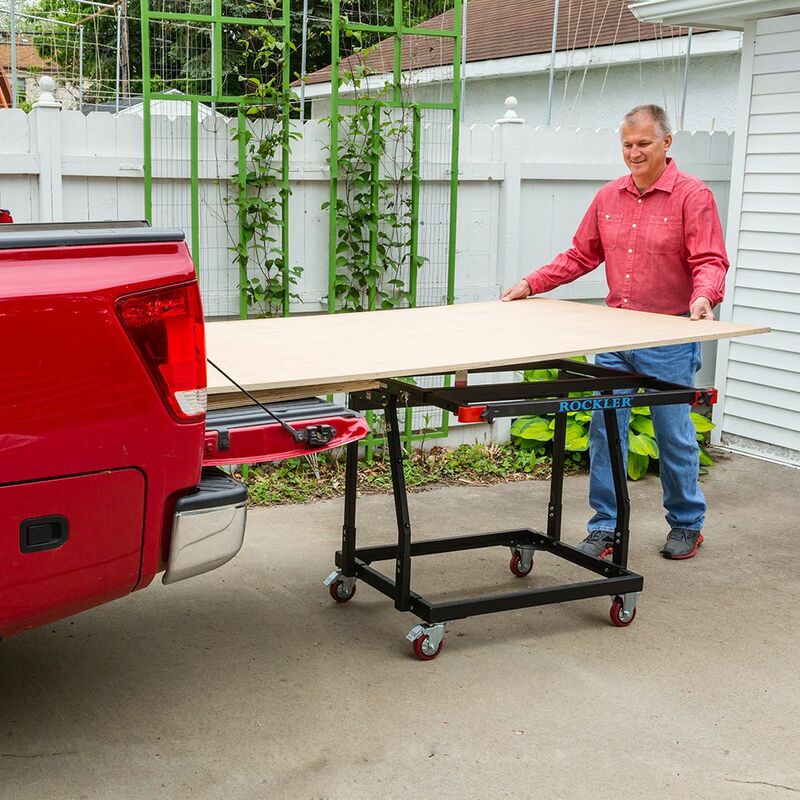 Smoothly roll sheet stock from your storage rack or vehicle to the table saw, or use as a mobile workstation! This cart is well built and thought out. works perfect unloading sheet goods from pickup bed to table saw. The locks on the wheels work perfectly. great for home shop. This is the best conceived and executed device I have ever purchased. The engineering is perfect and the workmanship is flawless. Working with this is like having and assistant for handling all types of sheet good. It makes good as an additional work surface when needed. I put four swivel locking casters on it and am glad I did. This will maneuver virtually anywhere within my shop. 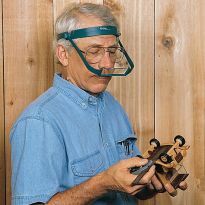 I read this suggestion on the Rockler site before purchasing and highly endorse that small modification. I just had to step back and admire how easy the assembly was on the Material Mate. Quality parts - bolts and nuts - fit perfect and you can use power tools without the fear of rounded off nuts and bolt heads. This is a great unit when you are older, working alone, and notice the weight of handling 3/4 inch hardwood plywood. Thank you for manufacturing a quality, practical product. Great for other applications! We just bought a 2nd one! Great product. It allows me to unload and transport plywood from my truck to the shop. Great for supporting plywood sheets at the table saw. I will find many uses for this product. Solid construction and easy assembly. Very pleased with the construction! Getting older and need a better way to move sheet good around my shop. After viewing a multitude of youtube about this, it was the way I wanted to go. Constructed out of heavy gauge rectangular tubing. Extremely well-built solid construction. It’s surpasses my expectations , Which nowadays doesn’t happen very often with all the cheap stuff being sold out in the world. This is a quality product one I would recommend to anyone. Used several times for large sheet goods. Tilts easily to move the sheets through the doorways. Put a butcher block top on it so when not used for panels I have an extra work bench. Excellent tool. 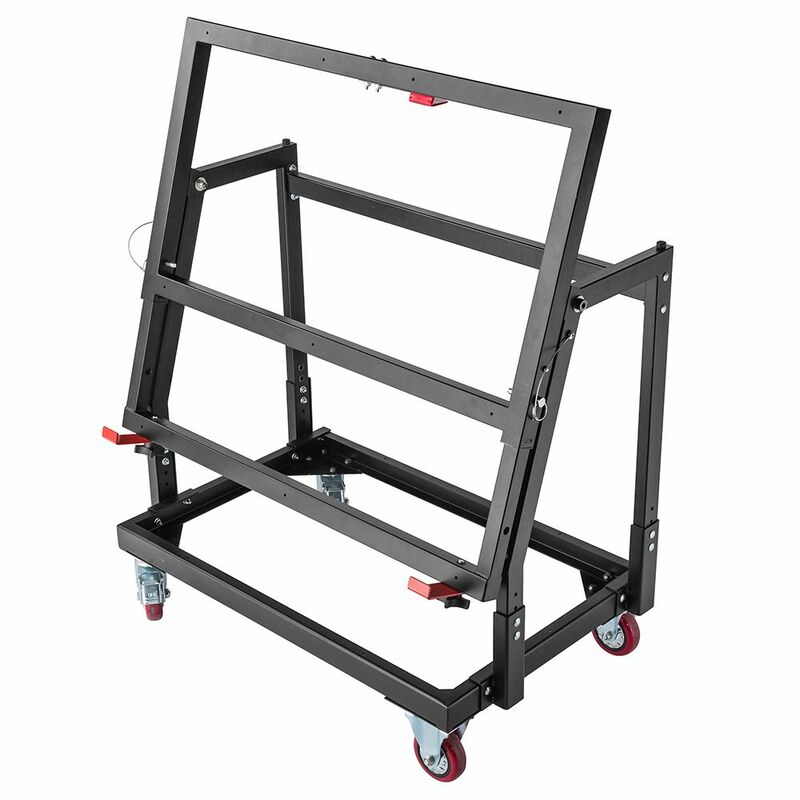 Sturdy, easy to assemble and perfect for handling large sheet goods. My first project was finishing a cherry butcher block table top. Too heavy for one person... no problem for the Material Mate. Tip- use a clamp to lock the tilt mechanism when using the Material Mate as a work surface. Easily move plywood from back of my truck, to the wood storage building, or to the saws. Minimal assembly needed. I have not yet explored possibilities of using as a mobile workbench. I found the two fixed casters limited my ability to maneuver around my shop so badly I was going to have to give the Material Mate only one star. Good idea, terrible execution.But before giving up I called customer service and was able to purchase 2 additional locking casters to replace the fixed ones. Now it performs exactly as I had hoped and it is an awesome addition to my shop. This is such a handy and wonderful addition to my workshop! It is easy to assemble & super easy to use. I'm already discovering that this material mate makes working with large sheet products much, much safer. I would highly recommend this tool to anybody. This is sooooo useful! I added a permanent top and textured FRP to the top, so that my sheet goods will slide more easily on to the table saw. Also, I changed the fixed wheels to casters. Now, it's much easier to align with my table saw. I found the assembly to be relatively easy and straight forward. Just used it for the first time to take plywood from storage and saw on my table saw. Process was easy, stable and good support while cutting. 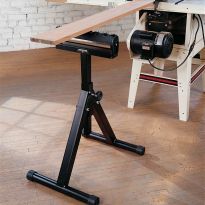 I like the idea of using this as a work table as well given its strength, stability and ease of movement. Don't know how I got by without one. Definitely recommend to all. I agree with others that 4 locking swivel caster would make moving in a smaller shop more convenient. I did one minor change during assembly. I put the caster washers between the hex head and the caster plate and used split locks on the nut side. The bolt heads are just not quite big enough to fully cover the caster mounting holes. I was pleasantly surprised by how well this cart works. I have used it to unload quite a few sheets of plywood. The cart's two positions made it much easier to get it off the truck and into the shop. Be careful to insure the red latch is fully engaged when loading plywood as the vinyl coating may keep it from locking securely. While it has never failed for me, I could see this being a problem. 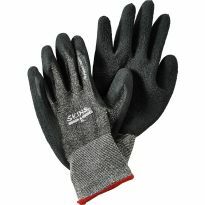 That aside, the quality of the materials are good and it performs as expected. I just purchased this Material Mate and finished the assembly. ( The instructions have an error, the locking pins are bolted on the inside, the picture is correct, the exploded view is wrong) I agree, I will add two more swivels on the fixed end as many have committed. In addition, the instructions call for the final top surface to be below the saw height, I find it better to have it slightly above the saw table height. These carts are great. They make transporting plywood (and doors) a breeze. The only improvement I would make it having for locking swivel casters in lieu of two. Never Thought It Would Be THIS GOOD! This cart is very useful especially in a small garage. It doubles as a secondary work surface for me and I absolutely love it. 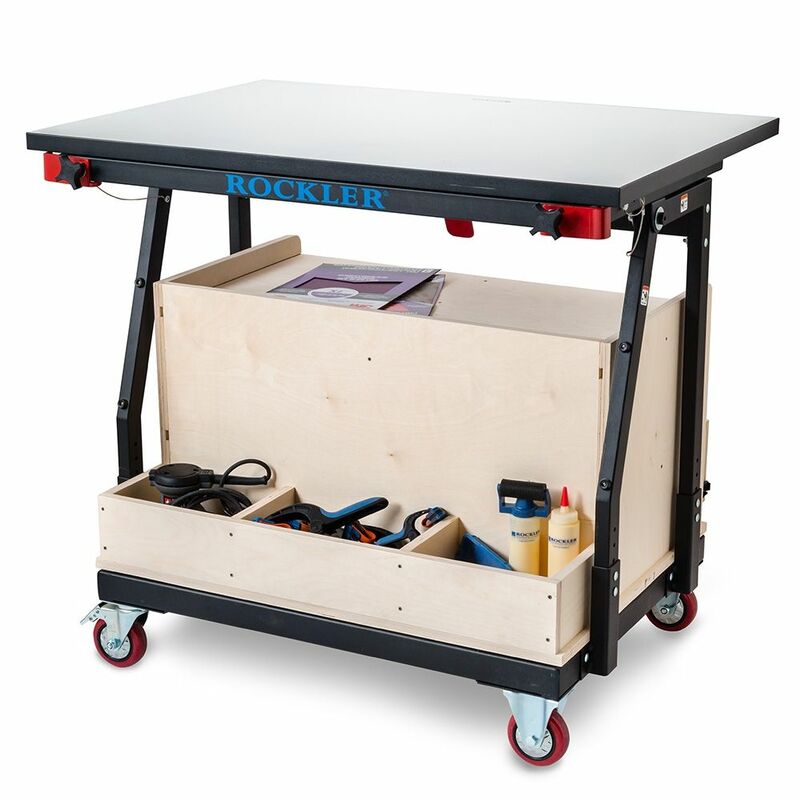 Rockler's Material Cart is a well worthwhile addition to my shop, since I usually work alone and handle 4x8' sheet goods by myself, which isn't easy, particularly 3/4" MDF. While a bit expensive, it is very well built and works well. I added a piece of 1/4" Melamine-coated MDF on the top, which makes it exactly the same level as my table saw and is more slippery than the cart alone, making it easier to slide sheets onto the table saw for cutting. This arrangement has eliminated the need for roller stands that always seem to tip over at the wrong time. Like another reviewer, I replaced the 2 fixed wheels with pivoting wheels, which makes the cart much easier to line up with my saw and to maneuver. The free downloadable cabinet plan is nicely done, but the designer didn't do a sheet layout. As currently designed, using 3/4" plywood for the cabinet case and 1/2" plywood for the drawers, it requires 2 sheets of 3/4" and 1 sheet of 1/2". Alternatively, the entire cabinet and drawers can be cut from 2 sheets of 3/4", which is what I recommend. I've tried other sheet good moving contraptions but have always needed help unloading the pickup and stacking the sheets in my shop. With this cart I can do it by myself which has made my Wife very happy. When I'm not moving sheet goods I use the cart as an assembly table. I'm giving the other contraptions to my sons. Way to go Rockler! 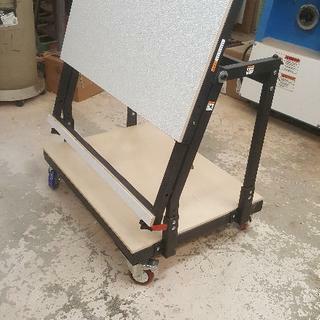 This cart is heavy duty, I also purchased a Rockler T-Track Table top to use on the material cart as a work table when I don't need to handle sheets of plywood. A couple of screws coming up thru the stand into the bottom of the table holds the T-Track table top in place until I need to use the cart to handle sheet of wood. This lets me tilt the top so it does not take up so much room, my work shop is a two car garage so space is at a premium. Very well made, easy to put together, handles plywood like a dream. Excellent! Highly recommended. 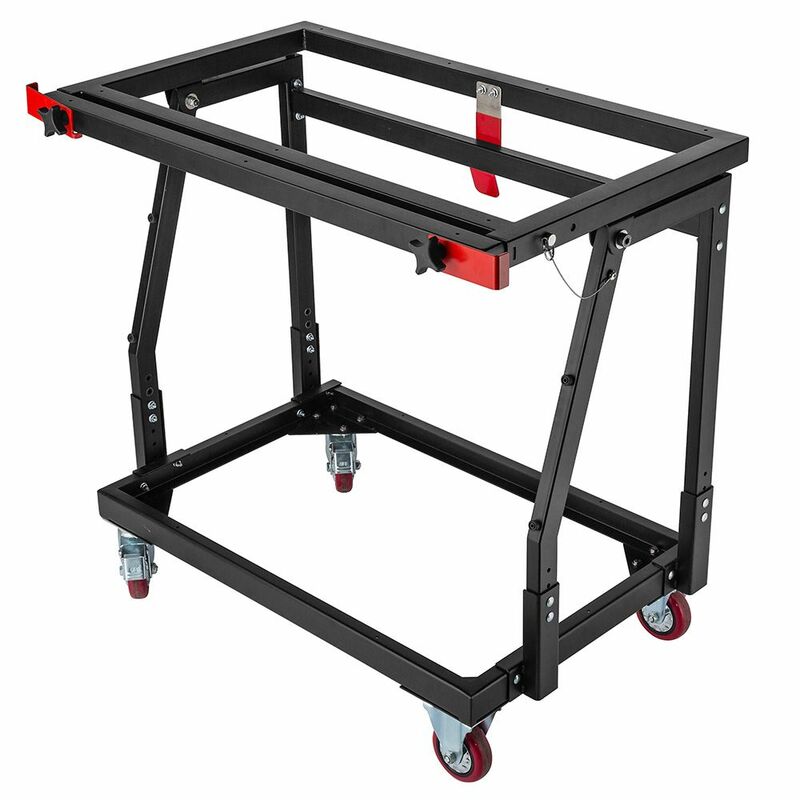 This is a super duper ideal cart for the shop easy height adjustable for differ machines. Just received my cart, putting it together went fine took about an hour, install a top everything went great, haven’t used it yet to get any plywood it is built very sturdy. The cart arrived via UPS in a badly damaged box, but the contents were perfect due to the closed cell foam packing, an early indication that Rockler paid attention to the details. The build was straight forward. Everything fit as it should and the components were robust. There were no shortcuts or cheap components in this kit. I liked the look of the Material Mate as soon as Rockler brought it out, but was turned off by the price. It seemed kind of steep, still does, but as I was starting a house renovation project I had a very realistic picture of what it's like to handle 4x8 sheets of material--any material. I'm 64 years old and wracked with arthritis, and though I still have the will, I need to do whatever I can to minimize the damage and pain of hossing big, heavy things around. I was using the Material Mate the day after it arrived, and I have to agree it's genius. Slide sheets right out of the back of the truck onto the MM, then tilt them up to get them through the door. Then I use it with sawhorses as a cutting stand. I added a top of 3/4 plywood, and a lower shelf of the same material. Now it serves as an extra small bench or a cutoff table for the saw. Very handy. All that it is cracked up to be! Incredibly well made! Had a little trouble aligning holes but my experience over came that issue. This will be easier than what I have now. I have a flat screen TV lift that I use for lifting 4x8s onto my tables. I've only used it for a TV once since TVs got lighter and lighter. I just finish a job and had hand surgery so I look forward to using my Material Mate. Appears to be well built and sturdy. It was easy to assemble. As I get older, plywood gets heavier. This works perfectly to move from pickup to table saw. Easy to use, I am 73, retired Marine Colonel, and now make cabinets and furniture. For cabinet interiors, I use pre-finished cabinet grade plywood, and it is heavy as you move from 1/4 to 3/4 inch. With this cart, I can now move it around my shop, tilt it up and run across my table saw with 54 inch fence capability. I wish they had all 4 wheels as 360 degree turn capability. This cart is exactly what I was looking for. Not only is it excellent for transporting wood material, but can also be used as a bench for other applications. 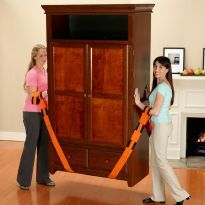 Easy to set up and moves with minimal effort and locks into place when you don't want it to move. It is a very good addition to my wood working equipment. It is an excellent product and high quality component. So far so good. Easy to assemble. Rolls smoothly. Could be a little bit taller though. Has made m life much easier. This product works very well. I can easily move plywood sheets from my truck to the shop .It also makes it much easier to elevate 4x8 sheets of plywood to the table saw from storage. Its a bit overpriced but well made. I changed the two fixed casters to the rotating type. This added another $25 but made it more versatile. A lot of times I am by myself, I like the flexibility with the Panel Cart. It is what I wanted; something to get a sheet of plywood off my truck bed and into the garage shop. 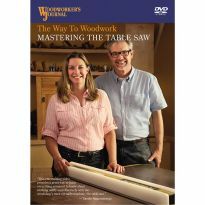 The ability to take the sheet of plywood off the cart and onto the table saw. It moves around very smooth and is a solid cart. I also liked the concept of being able to go thru smaller doors. Love it, wish I had it 20 years ago. Arrived quickly. Assembly was straight forward. Final product is sturdy and performs as advertised. Sure does make moving 3/4” sheets of plywood from truck to work table a breeze. Easy assembly, Works better than expected, what Else can I say! Actually does what it is designed to do, move large sheets of heavy plywood so it can be positioned to be cut on my table saw. I especially like the large wheels and sturdy steel construction, plus it was easy to assemble. Makes moving sheets of anything a piece of cake! All works very well. the on item i would like to see is (4) swivel casters. It would make the cart more maneuverable in a smaller shop. Otherwise it has been very useful with 4x8 sheets. I would highly recommend this product. As others suggested I believe adding swivel casters to this carrier is basicly a must. Specially for a tight shop. Luckily rockler sells an identity sized casters (blue rather then red). So makes that transition easy. Not sure why others were making that idea sound so complicated. I find my self needing to acknoledge the cool factor of this product while at the same time still thinking it is some what high in price. How ever I doubt the fit and finish of any knock offs of the design will be as nice. So over all given the expected life of the tool price probably justifies it self. Unit speciallynhelpfull loading heavy sheet on higher shelves for storage. Good reviews and I am getting to old to manhandle 3/4” plywood and MDF. Looks like a quality product with great reviews, hopefully it will help with material handling in the shop. This cart will make moving large sheets and panels a breeze. Recommendation from a friend who has one. This cart will come in very handy while stocking my shop with 3/4 plywood, feeding my table saw. I also plan to build I jig to add on top of it so I can load large beams to cut pediments on my bandsaw. I have several homes to build where the architect has designed these pediments on the front gables. It's the onlyl thing my husband asked for...for Christmas. Made my shopping super easy. Father's day is coming up and I have helped my husband carry in sheet rock and plywood before and it is not an easy job--I really think this will help him way better than I do!! i think this will be a great addition to my small workshop. I am a petite 67 year old female who happens to like building cabinets and other wood projects. I need all the help I can get moving large sheets of plywood. 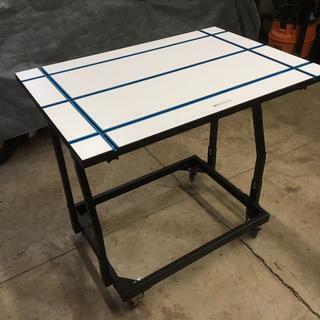 Earlier I purchased a T track table which I plan to use with this in the shop stand mode. My plan is to use the panel cart mode when needed. I have made a downdraft sanding table which I plan to use on top of the T track table. I like the idea of multiple use, compact storage mobile applications in my shop. I most times work alone. 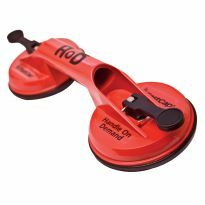 This great tool helps me handle heavy and bulky sheets of material easier and safer unloading and once at the table saw. workshop / material handling in the plant. Reasonably priced! My husband loves to build things for our home. Unfortunately, he has two herniations in his back. I'm hoping that this will allow him less pain while in the shop. I have issues with my back. Between that and being 67 years old, I can use all the help I can get when moving sheet stock around my shop. Looks like something I needed for handling my sheet goods projects. To help move and support sheet goods without straining my back. GOOD FOR MANY USES, LOOKS LIKE IT IS WELL THOUGHT OUT. I work in a cabinet shop. As a 5'5" woman who works with mostly 6 foot tall men, no one in the shop really understands what it is like to carry around 4'x8' sheets of plywood. It's not the weight, as much as the size. I am hoping this cart will put me on a more equal footing with the men I work with. To make handling sheets of plywood easier. 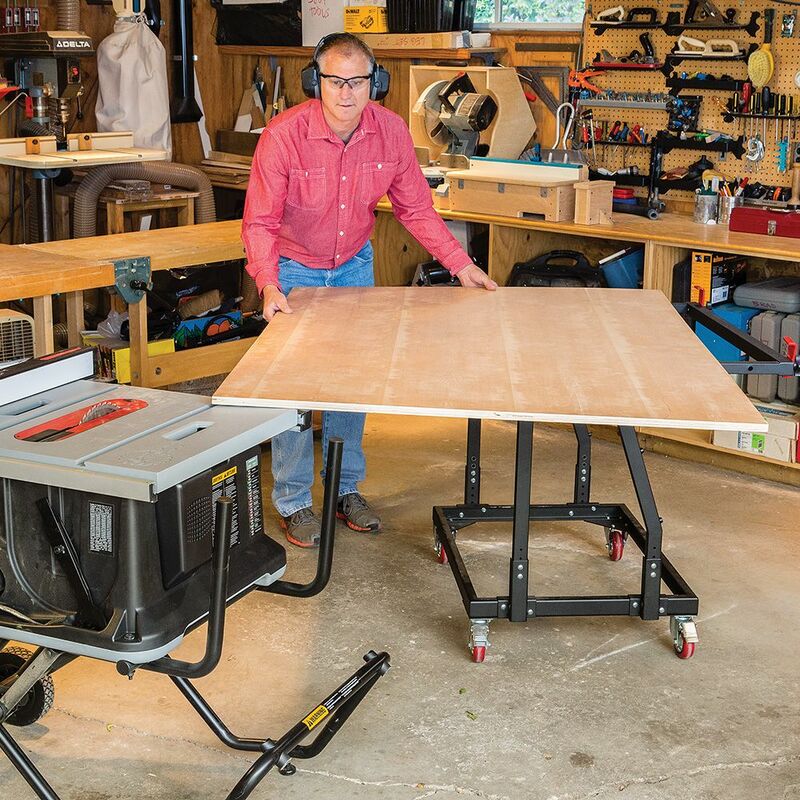 Dual Purpose: To use as a panel carrier and an outfeed table for a portable table saw. Like the adjustable height. Getting old and feeling puny a lot more. Looks like a very helpful piece of equipment. I cut a lot of sheet goods and this will come in handy. Good size with duel use and good value. Purchase because as I get older, the 3/4" plywood panels are getting heavier. Wish Rockler would sell the unit with four swivel casters and not force the customers into buying two additional swivel casters at a cost of $23.99 as any good company that was to satisfy the customer's needs. Hope they read this!!! Gift for my husband so he can handle lumber sheets by himself and I won't have to help him! I have used different products, but this is what I feel that I need to move the panel sheets from my truck to my table saw. As I get older, it is hard for me to move sheet stock. A tool that I believe will help me as I get older and stiffer. I have to move this stand over lawn and sidewalks to get to my shop, so could I replace the casters with 6-8" wheels and it will work ok? BEST ANSWER: Altering or changing the casters is not recommended, but as long as the hole pattern for the replacement caster is the same as the original caster it should work for your applications. I would like to buy two more locking/swivel casters to replace the fixed casters. Do you stock the exact casters sent with the original Material mate? 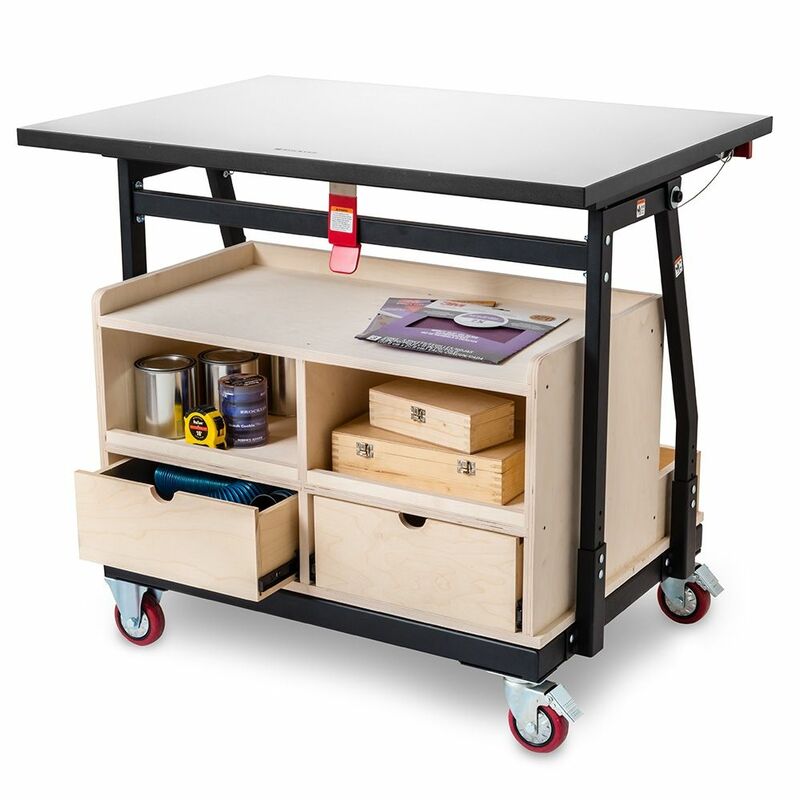 I just love this work table / storage table / material handler!!! BEST ANSWER: Here's a link to the matching casters if you want to have them all swivel. Note - it can be easier to maneuver a loaded cart across distances with two fixed and two swivel wheels (like a US shopping cart) than if all wheels swivel. Depends on how you are typically using it, though. The 4" casters rockler sells in packs of 2 are matching to the originals. Although they are blue rather then red. I was thinking the same thing. Having two fixed wheels requires more turning area in my already tight workspace. I was going to check my local distributors for a swivel caster with a matching height. I'll respond with what I find. I did find a swivel caster that works at one of the local big box home centers. The locking mechanism isn't as nice as the original casters, but mounting holes and height were the same. Now I can load and spin the sheets in a tight space. Has anyone found an exact match to the included swivel casters? I too would like to replace the fixed casters due to limited shop space. What is the material weight limit on this handler? BEST ANSWER: The material handling limit is 150 lbs. What T-Track top will work best? T Track top is 1 1/8 thick maximum is 3/4" thus 46654 T-Track top would not work. I had purchased the T-track op shown in the Rocky photo. It fit fine. 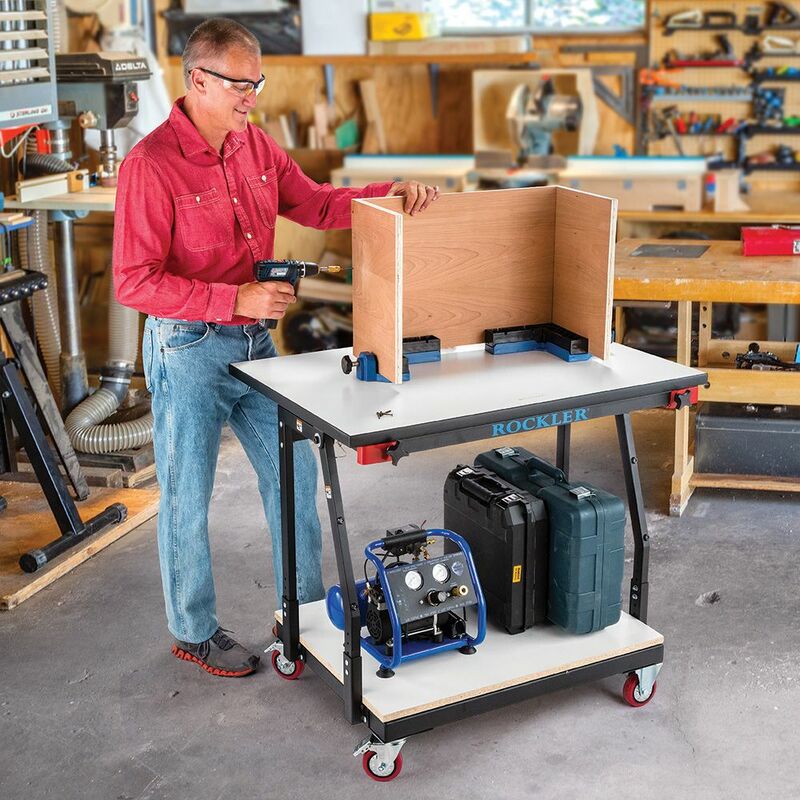 For those of you who have added the Rockler T-Track Table Top to your Panel Cart, can you still use it to carry panels while the T-Track table is attached or do you have to take the T-Track table off each time? If you can leave it on, what do you use to protect it when moving panels. 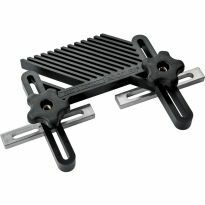 Is there a special kit for attaching the T-Track table to the cart? how can I modify the height so the minimum is 27-28 inches I need to remove the actions on grand pianos and because of a hand problem I need to avoid lifting them out and placing them atop the piano lid that is protected with a moving blanket . perhaps I need to take it to a metal shop and have them cut it ? BEST ANSWER: Raise the piano. I do not know how you would be able to get it down that Low, because the one side has the angle and to get it to go down farther will change things. Unless you have someone make and all new top to slide into the base and then you would have two option to put on for thr top sections. The lowest the flat top can be is 31 inches(with the wheels on). The highest is 37 inches. Plus you could add a sheet goods top which could add another dimension. 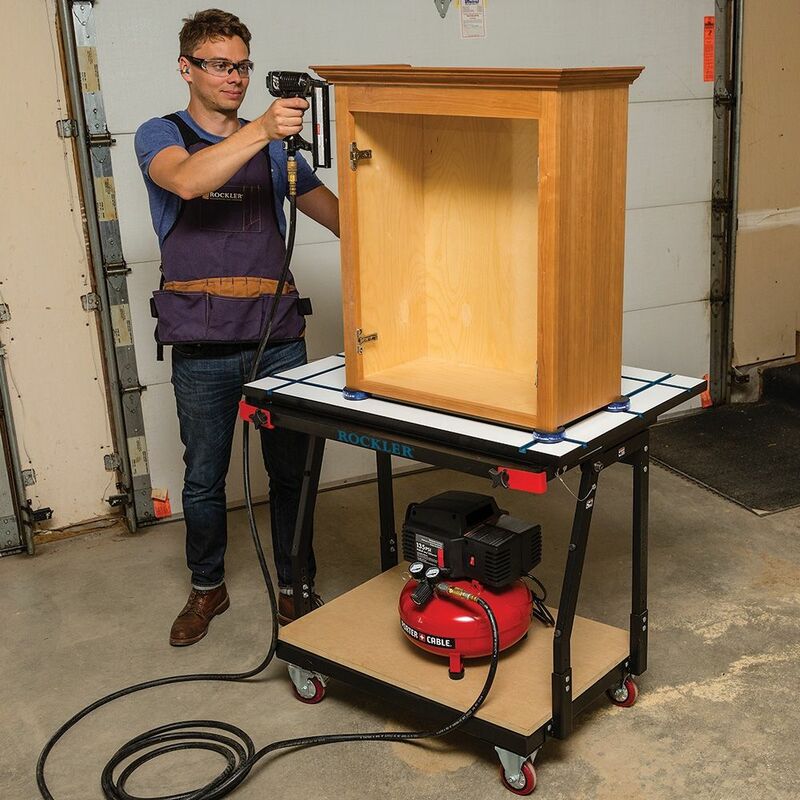 Replace the casters with workbench casters that Rockler sells or add additional adjustment holes in the vertical sleeves. Also, does adding the bottom shelf interfere with the tilt mechanism for fitting through doors? BEST ANSWER: I added a top shelf of 3/4 inch plywood (22 x 39) so I can use it as a work table. 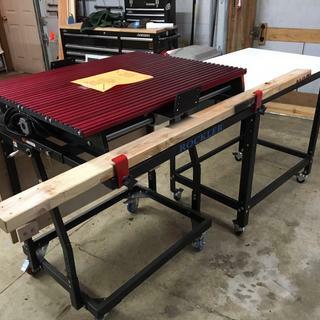 Most of the time I use it as a work table, or pull a full sheet of plywood out of my storage rack and easily pull it onto those two red tabs, then move it to my saw table (which just "happens" to be the same height I set the top of the cart to, and use it to saw the plywood while on top of the cart. Works fine. I figure that even though I may lose a little carrying capacity, it is worth it. I only tend to move more than 3 pieces of plywood at a time anyway, so the addition of a 3/4 inch piece of plywood for a work top is no problem. Have not tried adding bottom shelf. I used 3/4" plywood for the top and it doesn't interfere with the carrying capacity of sheet goods for me. I carry one sheet at a time. I suppose the top would make it difficult to carry more than one sheet in the tilted position. I find that a top allows me to use the cart around the shop for all kinds of other uses such as an additional work surface. I have not put in a bottom shelf, but I don't believe such a shelf would interfere with the lift mechanism. I added 1/2" top to mine, and it still handles 3/4" plywood with plenty of extra space. I added a 3/4" bottom shelf the same size as the frame, so it doesn't impact the ability to maneuver in tight places. There are several inches between the top of my bottom shelf and the bottom of sheet being carried when in the most vertical position. I measured 1-3/4" from the frame to the hook on the red holder so subtract your shelf thickness from that. Adding the bottom shelf won't interfere with the tilt mechanism. Will the flip top bottom rail extend to the floor because it appears that you have to pick up the material rather high to position it on the bottom rail of the flip top? If so it defeats the whole purpose of the flip top. BEST ANSWER: You do have to lift the material up to the red clips on the top. However, the clips are smooth, so for heavy material I only lift half of the board up and I slide it to its pivot point to get the other half on the other clip. If the clips were all the the way to the ground, the unit would be very unstable and would turn over easily. I would highly recommend this product if you work with large sheets by yourself. I have used it on my last 3 projects, and I can’t imagine going back to horsing the sheets around by myself. Unfortunately NOT but of the 2 devices I have to maneuver and control a 4 x 8 plywood sheet, THIS IS THE BEST. It does REQUIRE a lift however there are ways to maneuver and slide without damaging workpiece. When flipped ( is ease) gives GREAT control of workpiece when running through saw. Unfortunately, the flip top doesn't reach the floor. But you can lift up one side at a time to load a sheet of plywood on the cart. Are there built-in attachment points for the Shop Stand Tool Aprons? BEST ANSWER: There are no built in attachment points that i see on this unit. Being a craftsman I'm sure we could make one that would not interfere with th operation of the unit. Error in material mate storage cabinet plan drawer bottom listed as 1/2" but slot for it is 1/4"? Are there only two positions: horizontal and near-vertical? Is it able to stop somewhere in between say 45degrees? BEST ANSWER: No. It will only move to those dead stops. Though you could put a bolt to pin it were you want it. That's how the system it set up anywway. Just 2 positions, horizontal and near vertical. The way the stand is designed today would not allow extra positions. There are only two stops. In my job, i have to move and finish some large heavy mdf doors. The largest are 84 x 42. They seem to get heavier every year and often there is no one around to help. Will this cart handle a door that size? BEST ANSWER: Yes I would trust it to do so. But I would caution you to pay close attention to safety alerts in instruction and definitely not carry any more than one at a time considering weight and thickness of doors I believe you would have to field rig more than one door at a time in order to carry flat yes at an angle I would not suggest. Are you saying you would move them (one at a time) at an angle or up and flat? Flat I am not sure and don't have enough experience yet about angled weight and if you look at the hooks that hold the load I would not think any width over those hooks is advisable the designers had a reason for that hook gap, right. Carry that much weight flat and secured would be my bet safety first. Thanks. That makes sense. Safe rayher than sorry. This is as advertised. I use it for moving plywood and I'm making my own kitchen cabinets and storing them in a POD. I use the cart to move them into storage. I do wish they would sell the swivel wheels separately. l think they are over 100 lbs. I will contact manufacture to confirm weight. They sre just too big and heavy to lift up and put on saw horses by myself. I think l can swing one down on it's side on tbis cart, move ut to where I'm working and use the machine to help lift it up to saw horses. Not sure if there is a way to use it to turn them over. The instructions say that you can use the cart with 4X8 material. I haven't tried that yet but expect that I can when I need to. Since MDF is heavy I would check the wt limits in the instructions. Yes, it will handle that. We are using it to carry and cut 4 X 8 3/4" MDF, oak plywood and 1/2" Sheetrock. Very nice and helpful accessory for workshop. what is the largest top you can put on this and still use it to carry one sheet at a time and also what is the item number for the locking wheels? BEST ANSWER: I put 3/4 inch wood slats on the carries top, this still allows me to carry 3/4 inch piece of plywood on top of those with those two stops. I installed the slates to equal the height of my table saw, so I can just slide the plywood sheet right onto the saw top, no lifting. As far as the wheels, I have no idea. I surprised rockler can't help you with that. I would image a 4x8 sheet but Ijust matched the top. The wheels come with the unit. BEST ANSWER: Possibly. You would need to be very careful with any wiring under neath if you run it that way. I would be extra careful with the locking mechanism as it can have issues with locking in place. maybe secure that with a hru bolt. The door to my shop is only 27 inches wide. 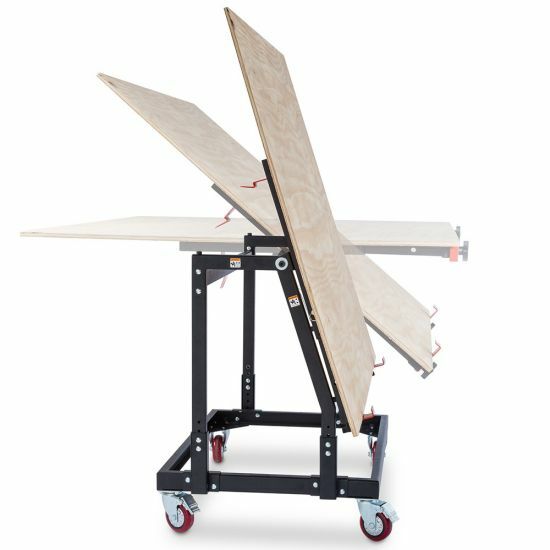 Would this cart make it through with a full sheet of plywood? Brian W's answer was more specific and more useful and not snarky like Tony S's. If I could have made the door larger, I would have done it already. Sorry, I really didn't mean to be 'snarky'. I had a too small door in the past that I had to enlarge and I was really happy once I got it changed although it took almost two full days! I really do love my Material Handler and use it a lot. Haven’t tried that yet but specs say 30 “ is max. how many sheets capacity has the cart? BEST ANSWER: You could;d possible carry 2 3/4" sheets but the weight may tip over the cart. You could carry maybe four 1/4" sheets. No more than two 3/4 sheets at a time safely. You can estimate the other dimensions but it's very well built. For 3/4 inch plywood it will hold 2 sheets. So it will hold sheets that don't exceed 1 1/2" in thickness. Do the locking casters that come with it lock the swivel as well or just the roll? BEST ANSWER: The locking casters are for roll only. There are two ‘safety locking pins’ for the swivel function. The swivel is locked as well as the roll. BEST ANSWER: NO, I does not lock in the tilted position. It was designed for 4' x 8' sheets. I sure like my cart, however, I don't see how it can easily handle your larger sheets. Not sure about the 72 x 96bsize I did do a 48 x 96 without any problem. There was a caution about trying that tilt with too many 4 x 8 sheets. Can anyone give me the answer? I just finished putting my material mate together and I can not find any thing on how to release the bullet pins. BEST ANSWER: Sometimes you have to wiggle the top to get them out. They can be a little tight. You just pull them. They are rather tight but they just pull out. When the tabletop is in it's most vertical position, what is the angle? BEST ANSWER: It is at about a 75% angle. Works great! 71-72 degrees on mine, using a digital angle gauge. Have not used it that way yet, sorry. BEST ANSWER: The top edge of a 4' wide sheet of plywood on the cart is between 62-62"" from the floor in the tilted position and it fits within the width of the cart which is about 25-1/2 inches. As far as a top goes, about 2x3 feet would be stable since that is within the dimensions of the cart. Beyond that depends on how much weight you might have out near the edges since they will be outside footprint of the cart. The cart itself isn't heavy like a workbench usually is, so you would have to be careful with a larger top. There are some holes in the top framework that #8 woodscrews will fit through from the bottom. Alan, thank you so much for taking the time to answer my questions. Your response has been very helpful. 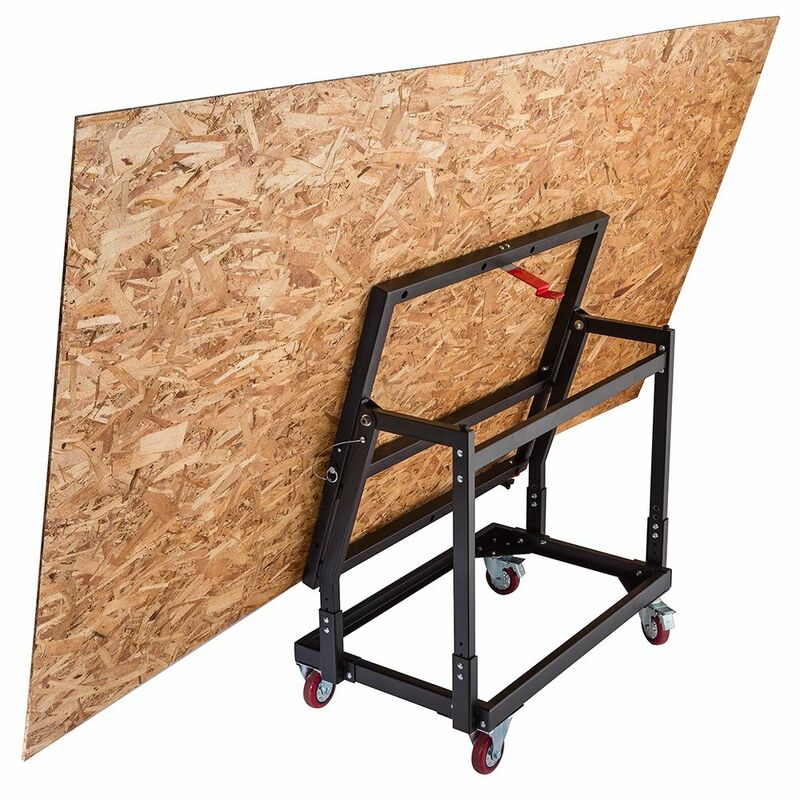 I need to get this cart because there is no way I can manhandle a 4 x 8 sheet of plywood without a cart like this! Thank again. 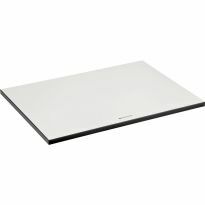 BEST ANSWER: With a base that is only about 25 inches wide, you'll have a lot of overhang. Personally, I wouldn't put a top with that much overhang on this cart. If you lean on the edge, I'd worry about it tipping. I don't remember where the two locking casters are on mine, but if you lift the weight off one of those, it may want to start moving sideways as well as tipping. The instruction manual recommends that when attaching a top, it is necessary to add narrow extension strip to the Material MateTM by driving screws (not included) through predrilled holes in the frame. I wish to add a T-track table top to mine. Do you offer an appropriate extension strip to enable this, or 1.25" melamine coated MDF from which one could be fabricated? BEST ANSWER: You could add just a strip of wood ripped down to the same width as your MDF top and it would work fine. I had the same idea, however, if the top is too thick then the red levers that flip up to catch the plywood when you use it as a tilt top to move large sheets may not be deep enough to catch the sheet being transported. I decided to just use a piece of 3/4" MDF for the top, and the strip, so I had more height for the red flip up levers. I also put a piece of 3/4" MDF on the bottom for a shelf. I am amazed how often I use my material mate. I also changed all the bottom casters to swivel locking and it is really handy to move in any direction. Rockler should change and include all swivel locks for greater flexibility.